Just a few minutes ago I was able to watch Ani-Matilda Serebrakian cross the finish line at the end of her run in the Slalom competition at the Winter Olympic Games. She came in at 68th place, beating Serbia, Iran, Lebanon, and China. The American favorite Lindsey Vonn did not finish. I watched the competition on Eurovisionsports.tv on the Internet, but just barely because I couldn’t watch more than 10 seconds of video at a time before the transmission froze for an additional 10 seconds. Public Television, conforming true to its lackadaisical coverage of the Olympics, did not bother to televise the Women’s’ Slalom Race live, even thought it would have been the last opportunity for Armenian nationals to root for an athlete representing their country at the games. Instead, they showed highlights of the Men’s Curling competition. Anyway, this post is about Ani. I was bummed out to hear that she did not finish the Grand Slalom race on Thursday but was hoping hard for the Slalom. It was sheer chance that I was able to catch her run at the very moment when the video was loading, and when I thought she had been disqualified at a moment where she actually stopped going downhill, but was indeed still standing, I was disappointed for her. Just the same, she completed her run anyway. Then seconds later the standings showed that she did in fact finish. Amazing. Fantastic job, Ani. We’re all very proud of you! UPDATE: As of 12:15 am (Yerevan time) the event judges ruled that Ani was disqualified. We’re still proud of you! Last night I was watching highlights of the Oympic Games on public television. All but three Giant Slalom skiers finished except for a Turk, a guy from South Africa who seemed to have stepped out of the gate at the wrong time, and the Armenian, Arsen Nersisyan (today’s standings show that several skiers were determined to have not finished after the fact). Nersisyan ended up falling near the end of his run. The whole time he looked wobbly on his skis, as if he was on the verge of wiping out, and sure enough he did. He simply didn’t have the form that other skiers displayed. Even participants from small island countries like San Marino near Italy finished. For a country that is mostly covered by mountains, you would think we would have a stronger men’s alpine skier to participate in the Winter Olympics. The president of the National Olympic Committee of Armenia is Gagik Tsarukyan, who is one of the richest and powerful men in the country. I don’t think anyone knows how much he’s actually worth–supposedly his wealth amounts several hundreds of millions of dollars. Some people think he is actually a billionaire. So you would think he would be spending some serious cash on churning out top athletes to compete. But judging from Nersesyan’s pitiful performance, that’s obviously not the case. And I don’t know if he really cares. I’d like to know why Armenia didn’t send a stronger team this year. If anything, we should be excelling at skiing, but we don’t. Nevertheless, we should be somewhere within the 50th percentile of alpine skiing finalists, in my opinion. I should add that I watched live on TV Gyumri native Kristine Khachatryan, who participated in the 10 km Cross-Country freestyle race last week, finish in 76th place. Third from last, but she finished, and I was very proud to see her cross the finish line. Let’s hope that Ani-Matilda Serebrakian, who is an Armenian-American, fairs much better in the Ladies’ Slalom and Grand Slalom competitions. I’ll keep you posted. Is Armenia’s Economic Crisis Really Over? I just read an interesting report on RFE/RL about what is being pawned off as the end of an “economic crisis” in Armenia. I guess that depends on who you ask and where in Armenia you live. Armenia’s worst recession since the early 1990s has come to an end, a senior government official claimed on Monday, citing official statistics that show the Armenian economy growing last month for the first time in over a year. According to preliminary data released by the National Statistical Service (NSS), Gross Domestic Product (GDP) increased by 2.4 percent year on year in January after shrinking by 14.4 percent in 2009. The reported growth was twice faster than the one forecast by the Armenian government for 2010. A senior official from the International Monetary Fund (IMF) said last week that the full-year growth rate may well reach 2 percent. The NSS data show that a 6.5 percent rise in industrial output was the main driving force behind the unfolding recovery. That seems to have primarily resulted from rallying international prices of copper and other non-ferrous metals, Armenia’s main export item. Armenian exports jumped by 57.5 percent to almost $54 million in January. Armenia’s macroeconomic performance was also positively affected by a 3 percent growth in agriculture reported by the NSS. By contrast, the construction sector, which has born the brunt of the recession, contracted by about 11 percent during the same period. Trade and Economic Development Minister Nerses Yeritsian portrayed the latest macroeconomic data as a clear indication that the economic crisis in the country is over. “And I want to assure you that we have come of out that crisis well,” he told journalists. In Yeritsian words, the recovery is facilitated by what he described as substantial capital investments that have been made in public infrastructures in the last two years. “They could not have failed to have an impact on the diversification of the economy and this growth figure,” he said. Finance Minister Tigran Davtian likewise asserted in late December that Armenia is emerging from the recession with minimal losses. Davtian downplayed the sharp GDP drop which has increased unemployment and poverty in the country. 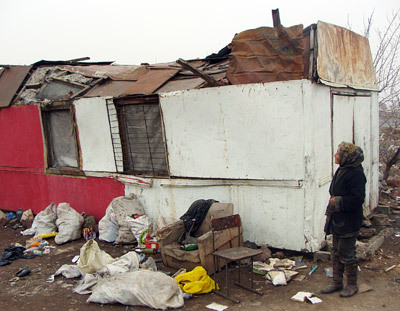 According to World Bank estimates, the number of Armenians living below the official poverty line rose by 90,000 to make up 28.4 percent of the population in the first half of 2009. If you ask me, Armenia did not go through a temporary crisis that lasted for about a year and only recently rebounded. Maybe Yerevan perhaps (I don’t believe this) but not the entire country. On the contrary, the economic situation of Armenia has been in crisis mode since it declared independence in 1991. Do I need to mention all the new shiny supermarkets, exclusive boutiques and expensive restaurants that have been popping up everywhere in central Yerevan? When [w]e visited the abandoned hut, Laura came out to greet us. The elderly woman was covered in soot and her cheeks were swollen from the cold. The clothes she wore were old and tattered. She spoke in a straightforward and lucid manner with us and said that the family had always encountered hardships and that they had now adjusted to their new situation. The family owned a one room apartment in the town of Kapan, Syunik Marz. They used the money to rent and lived in different places until they wound up here, at the garbage dump. She and the kids live in a metal “tnak” (hut) that is falling apart and the roof is missing in spots. When we stepped inside, the place was engulfed in smoke. Soot and grime was everywhere. Even the bed sheets were blackened by the soot. They had been burning garbage from the dump, plastic bottles, pieces of wood and shoes, to stay warm. The hut consists of two small rooms with two metal beds and a few chairs. “We live in a pretty awful state. I’m ashamed to even show you how we live,” Laura said. For the past two years the family has used candle to light the house. Mrs. Tadevosyan said they have no relatives in Armenia. They’ve all moved to Russia. Her son also lives in Russia and she says he sends money when he can. Washing glass bottles is their only source of income. Laura said that there’s a soda plant in Ashtarak. They get the bottles from the plant and wash them for 2 drams a bottle. Workers from the plant then come and collect the bottles. “I don’t wind up washing many bottles when it’s cold like this. At best, I can wash 1,500 a day. When the kids are home they help me out and I can wash more. The girl is just a child but she’s in water the whole day washing bottles for money. What else can I do?” Laura asks. Why Are Trees Still Being Cut In Yerevan Parks? Yesterday Hetq Online printed a disturbing, even perplexing report of trees being cut in Tsitsernakaberd Park, not far from the Genocide Memorial. Several lamps that light the walkways there were smashed as well. “I saw the smashed street lamps. When I looked hard, I realized that next to each smashed street lamp there are stumps of newly cut down trees.” This alert was raised by Tigran Mangasaryan, the publisher of National Geographic Traveler in Armenia. He spends each morning in Tsitsernakaberd with his friends. For the past few days he paid attention to the smashed lamps along the street leading to the Genocide Memorial. “I saw dozens of stumps along the road and a small fire trampled under feet, nothing else, neither branches, nor chips, nor sawdust, nothing. I got the impression that somebody cut down the trees, took them away under cloud of night without leaving any traces. That’s why all the lamps are smashed,” Tigran Mangasaryan said. The photos taken by Tigran Mangasaryan distinctly display all the traces of this crime. This material is simultaneously an alert for the RoA Ministry of Nature Protection . We think that the Ministry of Nature Protection represented by the State Environmental Inspectorate must examine this case and take proper measures. Why are such things still happening? During the “dark and cold years” of the early 1990s while war was being raged in Nagorno-Karabagh and Armenians were contending with an energy blockade, people were burning whatever they could find to keep warm during record-breaking frigid winters. That included trash, plastic bags, books, rubber soles, and of course, freshly cut wood from parks and the forest on the Nork-Marash hill, which no longer exists. It was regrettable that the trees were cut, and Yerevan citizens are still paying for their deeds today by living in a dusty city void of any decent parks containing no cafes and illegal structures. Yet gas lines supply residential buildings all over the city now. It took a while but now there is no part of Yerevan–unless I am mistaken–where such lines have not been installed so that residents can install relatively affordable, natural gas-burning heaters imported from Iran. Let’s say for instance that drifters or homeless people were responsible. If they were, they would also have some kind of semi-permanent shelter in the park, where there’s plenty of areas to take refuge. That means there would probably be someone hiding in the brush there who was responsible. But the article doesn’t mention that there were signs of such a scenario. Second of all, that area is well-lit during the evenings, since they installed bright, modern street lamps nearby the Kievyan Bridge and Halabyan Street, so it would be difficult to notice someone who wasn’t dragging away trees, even during the evening with taxis and other vehicles racing around. Even if those responsible descended the other way down the hill near the Hrazdan Stadium they would have most certainly been seen. So whoever did this was either very lucky to have not been caught red handed or probably just lit a bonfire in the park. But if that was the case, why weren’t the smoke and flames detected, and how did they manage to control the fire so that the forest didn’t burn? I don’t know if anyone in city hall or the police department is actually bothering to ask these questions or if this incident will ever be resolved. But I have a hard time believing that the culprits are very elusive. What Does the ARF Want? The Armenian Revolutionary Federation-Dashnaktsutiun (ARF-D) has managed to change its position on the government’s signing and subsequent expected ratification of the protocols at least four times since October. President Serzh Sarkisian will lose power if he presses head with the signing of controversial agreements with Turkey, a top leader of the Armenian Revolutionary Federation (Dashnaktsutyun) warned on Wednesday. On October 8, Markarian gave even harsher criticism, calling to seek regime change should the protocols be signed. Dashnaktsutyun, which was represented in Armenia’s ruling coalition until April, has so far refrained from seeking to unseat Sarkisian despite its harsh criticism of the two Turkish-Armenian protocols finalized by Ankara and Yerevan. It has instead proposed several amendments to the documents and tried to prevent their unconditional ratification by parliament.